Introduction: Primary percutaneous coronary intervention (PPCI) has become the preferred initial revascularization strategy in patients with acute ST-segment elevation myocardial infarction (STEMI). 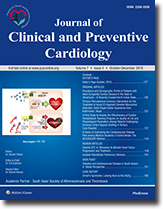 This study aims to find out the clinical profile and in-hospital outcomes of initial 100 patients undergoing PPCI in a newly established cath laboratory at Manmohan Cardiothoracic Vascular and Transplant Center, Kathmandu, Nepal. Methodology: This is an observational study including initial 100 cases treated with PPCI at Manmohan Cardiothoracic Vascular and Transplant Center starting from September 2012. All patients with STEMI arriving at the hospital within recommended period were included in the study. Data on safety and outcome were obtained and analyzed from records of the emergency room, cath laboratory, coronary care unit, and discharge records. Results: The mean age of the study population was 52.5 ± 13.5 years. Of the total patients, 41% presented with anterior wall MI, 51% presented with inferior wall MI, and 5% had true posterior MI. Single-vessel disease was seen in 59%. Left anterior descending artery was the most common culprit vessel (43%). Mean window period and door-to-balloon time were 8 ± 3.15 h and 59 ± 11.25 min, respectively. Drug-eluting stents were deployed in 82% of the cases. In our study, in-hospital mortality was 3%. Conclusion: PPCI can be an initial strategy to treat STEMI even at a newly established cardiac center if it is performed by a dedicated team with an experienced operator within recommended period. Background: Coronary artery bypass grafting (CABG) is the most common of heart surgeries. Cardiac rehabilitation has been identified as an essential and safer part of care for patients undergoing CABG which eventually would improve quality of life (QOL) and physiological parameters. Objective: The aim of this study is to assess effectiveness of cardiac rehabilitative teaching program (CRTP) on QOL and physiological parameters. Subjects and Methods: A randomized controlled study was undertaken in fifty participants undergoing CABG between June 2016 and January 2017 at tertiary care hospitals. The experimental group received CRTP. The control group received routine teaching. 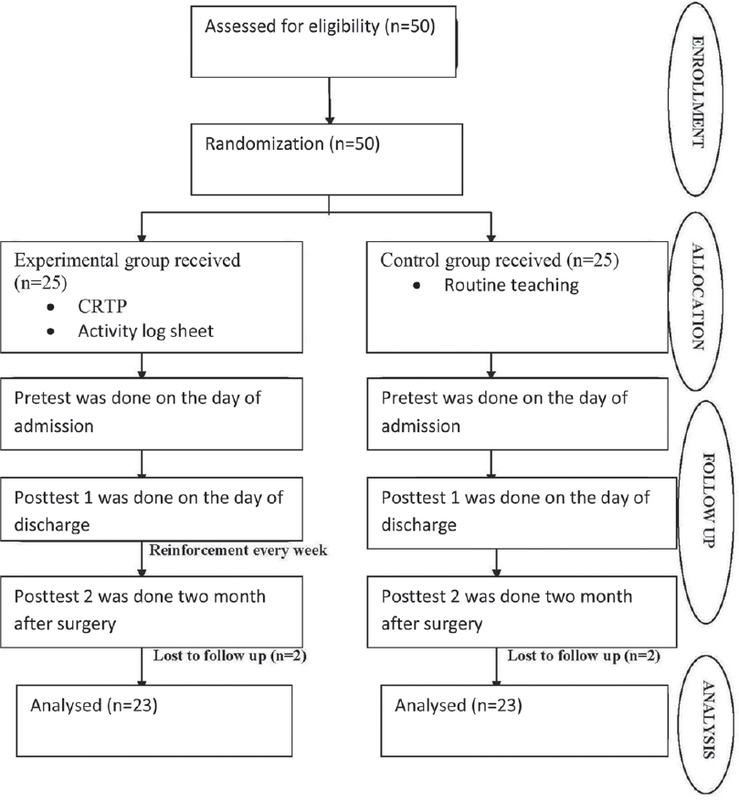 Data were collected at the time of admission, 1 week after discharge, and 2 months after surgery using WHOQOL-BREF questionnaire, activity log sheet, and physiological parameter checklist. Results: The QOL scores of experimental group were significantly higher than the control group, at posttest 1 and posttest 2 in all domains except social domain at posttest 2 (P < 0.05). In both the groups, the QOL scores improved significantly within the group in each domain (P < 0.05) except social domain (P > 0.05). Within the groups, there was a significant improvement in all the physiological parameter scores (P < 0.05) in the experimental group whereas only in heart rate in case of the control group. There was a significant improvement in diastolic blood pressure and hip-waist ratio of experimental group as compared to the control group (P < 0.05). Conclusion: Structured CRTP in CABG patients is effective in improving QOL and to some extent in improving physiological parameters. Background: The incidence of cardiovascular disease (CVD) in India is increasing at an alarming pace. Professionals with high-job stress and a sedentary lifestyle are at a great risk of developing CVD. Medical students are a population with very high level of stress and less time for exercise. Aim: The aim of this study is to estimate the prevalence of CVD risk among medical students and to compare with that of same age general population. Setting and Design: A cross-sectional study in the suburb of Ernakulam district of South India. Materials and Methods: A cross-sectional survey using standardized interviews along with measurement of blood pressure and waist/hip ratio among medical students and the general population. CVD risk for both groups calculated using the nonlaboratory-based INTERHEART modifiable risk score. Results: A total of 1014 people participated in the study (mean age: 21.3 ± 1.3), among which 396 were medical students and 618 were age-matched general population. Overall, 17.8% were found to have a moderate risk of CVD, and 2.8% were found to have high risk of CVD. Among medical students, 21% were at moderate risk for CVD (vs. 14.6% in general population, P = 0.01), similarly, 2.8% of both groups were at high risk for developing CVD (P = 1.0). Medical students had significantly lower prevalence of smoking (4% vs. 13.4%, P ≤ 0.001) and were physically more active than the general population (86.04% vs. 70.9%, P ≤ 0.001). There were no significant differences in the two groups regarding the other risk factors. Conclusion: The risk of CVD among both the medical students and age-matched general population are high in central Kerala; however, the medical students are not at a significantly increased risk than the general population. Measurement of cardiac biomarkers has become routine for the care of patients with heart failure (HF). 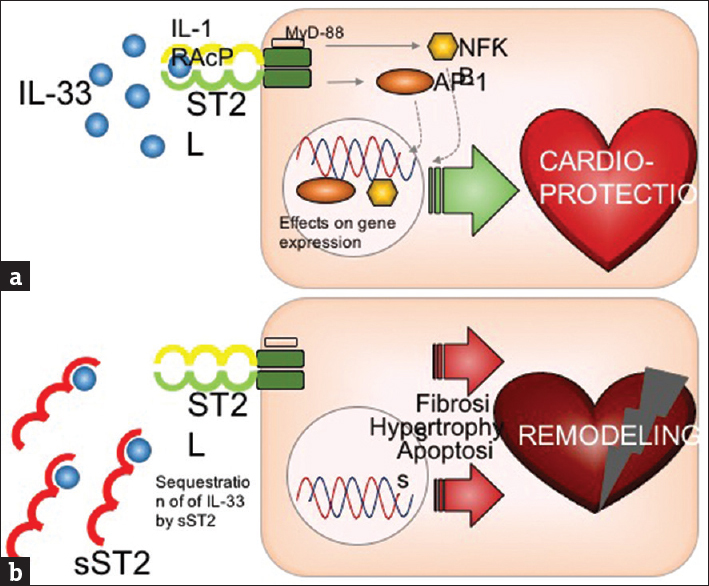 While troponin and natriuretic peptides are well-entrenched in the guidelines, soluble ST2 (sST2) is a novel biomarker that has shown consistent performance and is ready for clinical use. Multiple studies support the use of sST2 in both acute and chronic HF for prognostication. We suggest a novel scheme to guide HF management based on ambulatory sST2 levels. A case of isolated infundibular pulmonary stenosis is reported and literature is reviewed. Infundibular pulmonary stenosis is usually a part of tetralogy of Fallot or is associated with ventricular septal defect. Isolated infundibular pulmonary stenosis is rare. Patients may be asymptomatic in spite of significant stenosis. Dyspnea, chest pain, and presyncope or syncope on effort are common symptoms in significant obstruction. Ejection systolic murmur is best audible in the left 3rd intercostal space and increases on inspiration. Additional murmur of tricuspid regurgitation may appear if there is right ventricular failure. Absence of pulmonary valvular click and normal intensity and splitting of the second sound differentiate it from pulmonary valve stenosis. 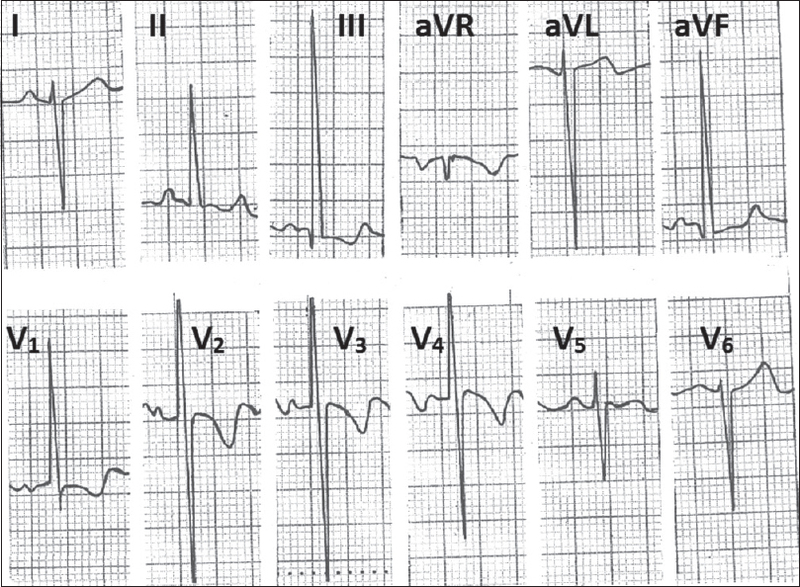 Electrocardiogram shows right ventricular overload. Two-dimensional (2D) echocardiography shows right ventricular hypertrophy with narrowing of infundibulum, normal pulmonary valve, main pulmonary artery, and branch pulmonary arteries. Right ventricle and right atrium may dilate if there is right-sided failure with significant tricuspid regurgitation. Doppler evaluation reveals systolic gradient in the region of infundibulum with no additional gradient at the level of pulmonary valve, main pulmonary artery, or branch pulmonary arteries. Tricuspid regurgitation may be present. 2D echocardiography with Doppler evaluation also excludes other lesions. Angiography is usually not required. Surgery is safe and effective in relieving obstruction. Stent implantation is safe and effective in highly selected patients with discretely narrow circumferential stenotic segment and near-normal-sized peristenotic segment between the pulmonary and tricuspid valves. South Asians (Indians, Pakistanis, Bangladeshis, and Sri Lankans), have very high incidence of metabolic diseases, such as hypertension, abdominal obesity, metabolic syndrome, type-2 diabetes, and vascular disease. To create awareness, develop educational and preventive strategies, we started a professional society, South Asian Society on Atherosclerosis and Thrombosis (SASAT) in 1993, at the University of Minnesota. Since that time, we have organized fifteen international conferences in India and published several monographs on this topic. In our conferences, we have discussed all aspects of epidemiology, risk factors, and excess burden of these diseases in this ethnic group in India and abroad. In general, South Asians seem to have excess incidence of diabetes and coronary artery disease, no matter which country they live. There are speculations about the reasons for this excess; however, no definite risk factor or a cluster of risks have been attributed to be responsible for this excess disease burden. National health programs in various countries, such as the UK, and Canada, with large number of South Asian Immigrants, have developed ethnic-specific preventive measures. The World Health Organization has issued special guidelines about the BMI cutoff, for this ethnic group. During the tenure of the President William Clinton, recognizing the important role the South Asian community has played in the USA, he recommended some studies related to their health. Again in 2009, President Barack Obama signed an executive order, calling for strategies to improve the health of Asian Americans. In a recent issue of the Journal of Circulation, the American Heart Association has published a scientific statement about the atherosclerotic disease in the South Asians living in the USA. The Vice chair of one of the councils, Dr Latha Palaniappan also has published a companion report called, “Call to Action”: A science advisory from the AHA. In this overview, we will discuss briefly the work of SASAT, and present our views with a global perspective. Ortner's syndrome or the cardiovocal syndrome is characterized by hoarseness of voice which is caused by the paralysis of the left recurrent laryngeal nerve as a result of cardiovascular causes. We report two cases; the first one was a 40-year-old male, who presented with hoarseness of voice, dyspnea on exertion, and central chest pain of 6-month duration. 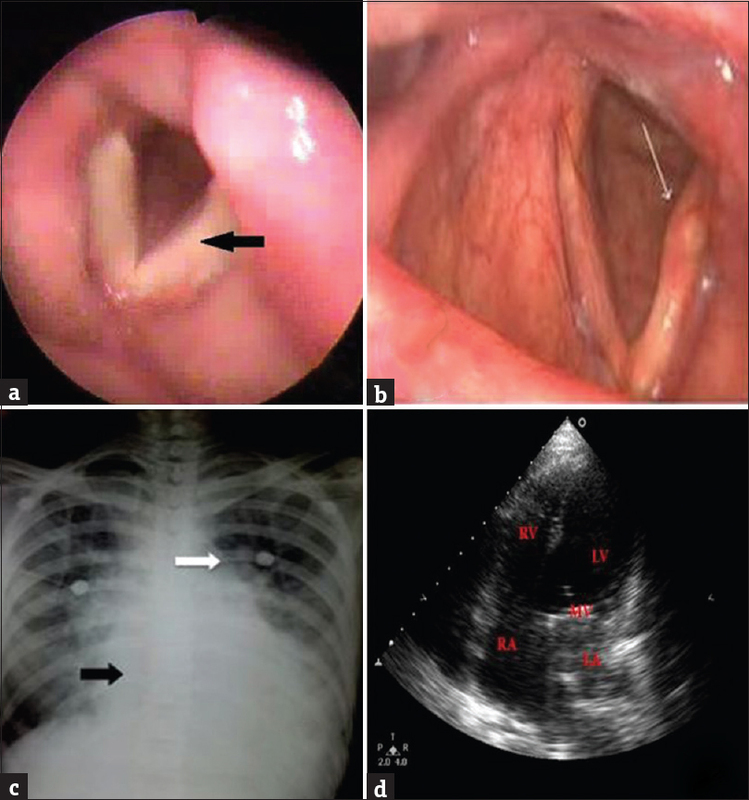 Videolaryngoscopy revealed left vocal cord palsy and an echocardiograph showed severe calcific mitral stenosis. The patient underwent mitral valve (MV) replacement and recovered left vocal cord function within 3 months. The second patient was a 52-year-old female, who presented with dyspnea on exertion, intermittent palpitations, and hoarseness of voice. Videolaryngoscopy revealed left vocal cord palsy. Echocardiography revealed features of rheumatic heart disease with severe mitral stenosis, moderate mitral regurgitation, severe tricuspid regurgitation, dilated left atrium, right atrium and right ventricle, and a left atrial appendage thrombus. The patient was subsequently taken up for MV replacement and left atrial thrombectomy, but the left vocal cord palsy persisted after surgery. Cardiovocal syndrome is rare in the general population but associated with causes such as aneurysms and MV stenosis. A high index of suspicion is needed to make an early diagnosis which can lead to surgical correction of the underlying cardiovascular disease, and the pals may resolve spontaneously following treatment.